It falls to me this New Year to dispense a little food for thought and, yes, you’ve guessed it, the subject matter is size – obesity. Fat, brought about of late no doubt, by overindulgence, but not necessarily so! On a personal level, I’ve gone the full spectrum of sizes 0 to 20 and back again many times over and tried every diet known to man, so to be told that you are ‘morbidly obese’ is a shock and a truly terrible title to live with. It’s even enough to make you pass the fast food outlets on the way home, as putting it bluntly, you are so overweight that there is a distinct possibility that you could develop a life-threatening condition of which you will die and in the not too distant future – perhaps even sooner if you’ve just consumed a large chicken vindaloo. At the recent launch of The Foresight Project, which aims to tackle obesity, I was fortunate enough to be convinced that I was not alone in my quest for a sylph-like silhouette and that there was the backing of the entire government behind me and all the other morbidly obese people in the UK. The project has taken a strategic 40-year forward view of how society could respond sustainably to obesity. Indeed, such is the extent of the problem that tackling obesity has been likened in scale to the concerted effort required in tackling climate change. The figures are scary, with 60% of men and 50% of women likely to be clinically obese by 2050. By that time, obesity related disease is estimated to cost the NHS an extra £45.5bn a year. The Foresight strategy acknowledges the need for a societal approach on multiple levels: personal, family, community and national. It requires partnership between government, science, business and civil society and, surprise surprise, it actually mentions the role of the workplace in all of this and, of course, the good old works canteen. There were new terms introduced – well, new to me anyway – and the representative from Tesco who happened to be sitting next to me sat up and took notice when ‘Obesogenic Food & Drink’ was mentioned and how retailers were responsible for ensuring clear and adequate labelling to aid healthy choices. Not a lot new here, I thought, apart from the trendy new wordage, though the emphasis on the importance of health messages throughout the life course was quite heartening. 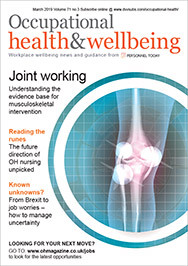 Having been embroiled in the Health, Work and Wellbeing strategy (HWWB) for the past few years, I was feeling all ‘strategied out’, despite being there in my public health capacity. So, focusing on the figures, I tried to calculate just how much money was to be saved between these two projects over the foreseeable future, and who would ultimately reap the benefits. The delegate information packs at the Foresight launch must have cost a fortune, and I was surprised that there was no sponsorship behind it. What I thought was a calendar or elaborate presentation pack actually turned out to be an ‘Obesity System Atlas’. This large and unwieldy document contained what can only be described as something resembling an acupuncture meridian map of an octopus. I had to wonder who would have put such a document together and, furthermore, what exactly one was supposed to do with it, though I guess studying it would put you off your food, or at the very least give you indigestion. I feel far more headway is being made with the HWWB strategy, as we can already see the benefits. The amount spent on incapacity benefits is falling (£16bn in 2002, compared with £12.5bn in 2006-07) and the figures will most certainly decrease as the welfare reforms kick in and claimants are moved off incapacity benefits and on to other more appropriate means of support or, more optimistically, back into work. Will this money cover the increased burden on the NHS that the morbidly obese create, or better still, a pay rise for the nurses who will be required to look after this ‘growing burden’? If tackling obesity has been likened to tackling climate change, then the outcomes and benefits won’t be evident in my lifetime. But with more people being ‘helped’ back to work, maybe the extra activity generated will bring about an obesity reduction all of its own, and as a by-product the added benefit of ‘feel good’ endorphin release from this activity will bring about a tidal change in psychological wellbeing – now we’re talking! If the HWWB strategy achieves its aims and objectives, then Foresight’s bleak predictions will be totally wrong. For the sake of our children and grandchildren, I hope so.